Cellos should fit their players. 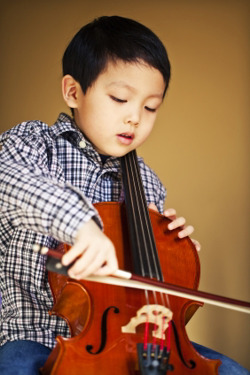 The size makes a difference in both the distance the musician must reach to the fingerboard of the instrument and the distance the notes are separated on the fingerboard. Cellos sizes are denoted in fractions: 4/4, 3/4, 1/2, 1/4, 1/8, etc. However the fraction nomenclature can be misleading because, for example, a 1/2 size cello isn't really half the size of a 4/4 cello, as you can see by the chart below. So how do you know what size is right? Often the teacher will measure the student and write down the correct size to get. If your teacher recommends a size, that is the size you should get regardless of any measurements you or anyone else might do. Otherwise to fit a player to a cello, have them sit so their knees are bent at 90 degrees. 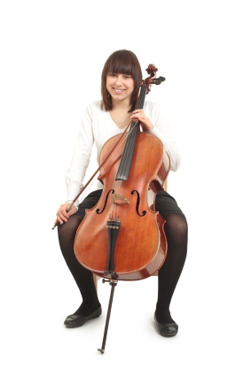 Adjust the height of the cello so the left knee touches the curve below the lower bout corner. If the cello fits correctly the upper rim of its body will rest on the sternum (breast bone) and the lowest tuning peg will be near the left ear.. From this position the cellist should be able to comfortably reach both ends of the fingerboard. An alternative method of fitting uses a "fitting yardstick" marked with the instrument sizes. When the end of the yardstick is placed against the student’s neck and stretches the length of his/her outstretched arm, the correct size is the one that is closest on the yardstick to the student’s palm.